You’ve probably seen charts in many clinics that give an idea of how much you should weigh. These charts consider your weight, height, frame size, and gender- then provide an estimate of how much you should weigh. At best, the charts can only classify you as underweight, at proper weight, or overweight, based on your frame size. But what these charts don’t take into account is your body composition; how much lean body mass and fat you have. 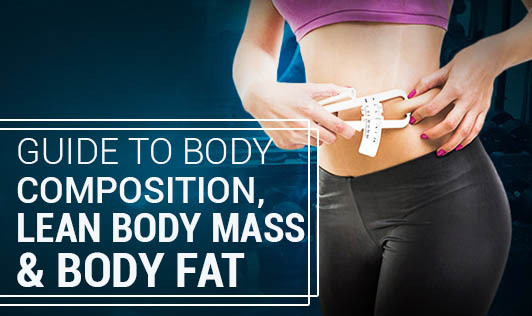 Your total body weight is made up of two parts- 1) Body fat AND 2) Lean body mass. Body fat is further divided into- Essential fat & Storage fat. Essential fat is a very small amount which is stored in organs (the heart, lungs, liver, spleen, kidneys, and intestines) as well in muscle tissues, tissues of the central nervous system, and in the bone marrow. It is essential fat because the body requires this fat to maintain normal body processes. Storage fat serves to cushion the internal organs (called visceral fat or abdominal fat) and the fat that lies just beneath the skin surface (subcutaneous fat) acts as a cushion for the skeleton and conserves body heat. Excess accumulation of visceral fat is associated with many health issues, which is why it’s important to keep body fat within a healthy range. Lean Body Mass is simply not fat. This component is present in your bones, organs, muscles, ligaments, tendons, and fluids. Lean mass and fat mass are made up of 2 types of cells and tissues and (even though people say this all the time) muscle can’t “turn into fat”. Body Composition Analysis (BCA) provides useful information on who is “thin”, “lean”, “overweight”, or “obese”. Healthy body fat levels are around 15% for men and 22% for women, although these values will vary as per age. A proper diet and exercise program can help individuals achieve and maintain healthy body weight and shape. A proper exercise program can help build and maintain muscle mass, and increase the body’s lean mass.